An onnagata (female impersonator in kabuki) is combing the hair of a wakashu-gata (actor specialized in playing young male roles). Due to the strict rules imposed by the Tokugawa shogunate, a love scene (nuregoto) is intimated here through the symbolic gesture of combing hair, which is seen as a sign of special affection. This may be a scene from one of the Soga dramas. An onnagata actor is preparing another actor’s hair for youthful roles (wakashūgata). The kimono of the female impersonator is decorated with rushes in a watercourse. He has let down a heavy cloak with red lining (uchikake) and red maple leaves as far as his waist. The kiri crest, which cannot in this case be attributed to any particular actor by name, appears on the shoulders and sleeves. His long hair hanging down his back is tied low, while his bare-shaven forehead is covered with a scarf (yarōbōshi). 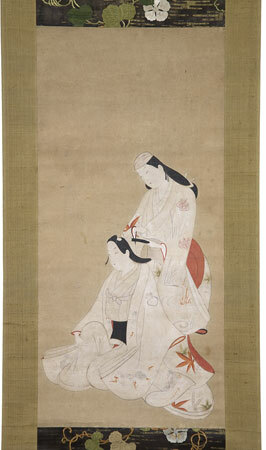 His partner sitting in front of him is wearing a robe decorated with pine twigs over a plain garment. On his shoulders, a cherry blossom is combined with a square to form a mon. This crest also could not be identified. The scene comes perhaps from one of the innumerable Soga dramas. According to the strict directives of the Tokugawa Shōgunate, no real love scenes were allowed on stage. Sensuous love was therefore expressed by means of various symbolic gestures. Combing the hair was one of these, and was a sign of especially deep affection.